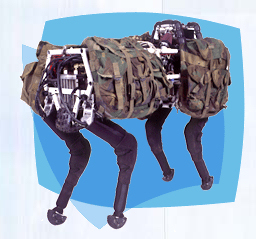 Boston Dynamics has some pretty cool robots designed primarily for military type purposes, but their flag-bot design is the called the BigDog. The BigDog is a gas powered quadruped that is about 1 meter long, weighs 75 Kg and can carry 120 pounds of cargo at 3.3 mph and climb a 35 degree slope. When “running” it looks kind of like two guys facing each other carrying a long pack, and it continually “trots” to keep it’s balance. It can navigate through rugged, muddy and snowy terrain and keep itself from getting into a jam. It can also take some external blows without losing it’s balance. 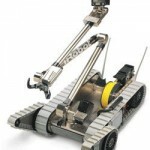 The 4 legged robot has an on-board computer that controls it’s movement through servo motors and sensors to maintain direction, balance and make decisions about moving through it’s terrain. It even can absorb energy back from steps to make itself more efficient. I can envision many applications that could use this type of robot. You really need to see the video of this quadruped to get the idea. It is definitely worth the time. Private ‘SUGV Early’ Reporting As Ordered, Sir!